* Sold out* A second seminar is being held on July 18th at the Manhattan Beach Library. For more informaiton click here. 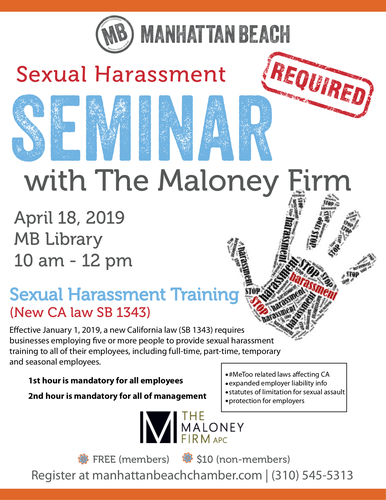 Effective January 1, 2019, a new California law (SB 1343) requires businesses employing five or more people to provide sexual harassment training to all of their employees, including full-time, part-time, temporary and seasonal employees. Management must receive two hours of training and non-supervisory employees must receive one hour, to be repeated every two years. Most existing employees must be trained before January 1, 2020. The Manhattan Beach Chamber of Commerce is pleased to present a two-hour employment law seminar that our business partners may use to satisfy their SB 1343 harassment training obligations. All employees may attend the first hour, which will cover the required anti-harassment curriculum, with a second hour for management to address the handling of harassment and other employment claims. Additional new 2019 #MeToo related laws affecting California businesses will also be reviewed, including expanded employer liability under California?s Fair Employment and Housing Act, increased protections for sexual harassment victims, longer statutes of limitation for sexual assault, expanded relationships covered by harassment laws (beyond employer/employee), protections for employers disclosing harassment investigation results and limitations on confidentiality in sexual harassment/assault settlements.